Grazyna Auguscik, six-time winner of the Best Jazz Vocalist award by the European Jazz Forum, and her musical partner of more than a decade, guitarist Paulinho Garcia, will perform at 3 p.m. on Sunday, Dec. 2 in Strong Auditorium on the University of Rochester River Campus. 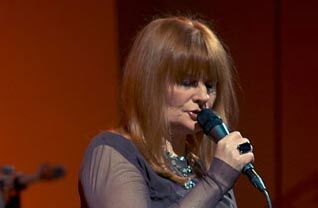 Hailed by music critics as “one of the hottest jazz talents,” the Polish-born singer, composer, and arranger has built an international reputation with her evocative vocals and genre-blurring style. “Auguscik and her ensemble sound like nothing else you ever heard; they are out of this world,” wrote Howard Reich of the Chicago Tribune. The upcoming concert marks Auguscik’s first appearance in Rochester and is made possible by the Skalny Center for Polish and Central European Studies. Admission is free and the event is open to the public. Free parking is available in the University’s library lot. Auguscik has recorded 17 albums, 10 of which were under her own record label, GMA Records. She also is a prolific collaborator, sharing the stage with such jazz notables as Michael and Randy Brecker, Jim Hall, Toots Thielemans, John Medeski, Paul Wertico, Kurt Rosenwinkel, Robert Irving III, Michal Urbaniak, Terry Callier, Patricia Barber, John McLean, Jarek Bester, and many others. Her unorthodox and adventuresome approach to rewriting classics is evident in her recent album “Personal Selection” and “The Beatles Nova,” a reinterpretation of Beatles classics she produced with Garcia. A new album, “Man Behind The Sun,” is a tribute to the English musician Nick Drake. Auguscik’s dedication to reinvention and collaboration were exemplified in her 2010 concert “Chopin World Sound” at Millennium Park in Chicago, which featured 14 musicians showcasing the Polish composer’s masterpieces. The performance attracted a crowd of more than 10,000 people and was chosen as one of the 10 most important performances during last three decades in the Chicago area, next to Miles Davis, Ella Fitzgerald, Wynton Marsalis Septet, Frank Sinatra, Marcus Roberts, Tropicana Orchestra, Danilo Perez, Oscar Brown Jr., and Igor Butman. Joining Auguscik is guitarist and vocalist Paulinho Garcia, who came to Chicago in 1979 from his native Brazil. In 1991 he founded his own band, Jazzmineiro, whose eponymous 1996 album received excellent reviews in the Chicago Tribune, Jazziz, the Brazilian Music Review, and The Brazilians. Garcia won “Best Jazz Entertainer” at the Chicago Music Awards in 2001 with saxophonist Greg Fishman, and he toured Poland, Prague, and Bratislava with Auguscik in 2000 and 2001.